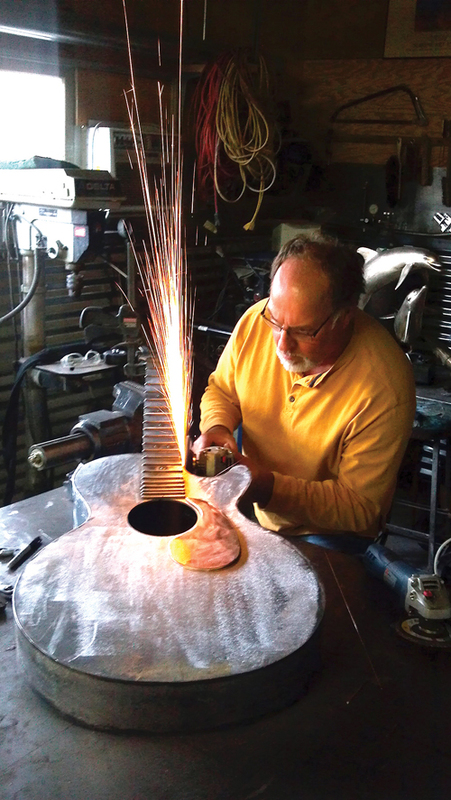 Author Dale Evers working on a metal sculpture. Paso Robles or EL Paso de Robles, as I refer to it, because it sounds way cooler, has developed into world-class wine, culinary, and as of recent, a fine art destination. It was only a matter of time before Paso Robles would become a dominant player in the evolution of the San Luis Obispo County visual arts landscape. I moved to SLO County in 1980. Fresh out of the Army, I embarked on my educational journey at Cuesta College. In an effort to augment my GI bill income, I began to sell my wood carvings. My first gallery sale was out of a small gallery in Cambria in 1982. That was essentially the beginning of my more than three decade art and design career. At that time Cambria was the most established art community in SLO County, and arguably still is today, but all that is about to change. Paso Robles is intrinsically ripe for the visual arts because of a unique blend of its historical, hospitable agrarian roots, and a non-pretentious wine industry. Now enter, Paso Robles art boom. The boom actually started long before now and here is why: Many world-class artists had already based their national and international careers out of North County SLO. The late John Jagger comes to my mind first because he was one of my main inspirations. Paso was home to the likes of the amazing Lisco family of painters. The list goes on and on: John Cosby, ‘Matriart’ Anne Ladden… Dennis Curry, Randy Stromsoe; all very serious professional artists. Let’s face it, if you can create art anywhere and make a good living at it, why wouldn’t it make perfect sense to base your studio out of Damn-near Paradise: California’s Central coast region. Rewind eight years: I was based out of Morro Bay, another burgeoning art market, but all the buzz was about the future of Paso. About that time I began a long distance love affair with Paso Robles. Ironically, there was not one fine art gallery in Paso then, but I smelled blood in the water. I was certain that Paso was ripe for a vibrant new visual arts renaissance. I moved my studio operation to Templeton in 2007 into the exact building that the Barrel House Brewery is in today. Then in 2011, I moved again to current location at 1000 Park Street, one block off the park downtown, Paso Robles. The park is just amazing and it had an unequaled charm that of anywhere in SLO County. It was Jackie & Dianne sucking on a chilidog and sipping a smooth 2004 pinot. The problem at that time was that there needed to be a pioneer to start a fire under the visual arts. As it turned out, the ‘queen-pin’ in all of this would be, none other than, the tenacious, mountain-moving ‘Matriart’ Anne Ladden dozing the way with her working-studio vision: Studios On The Park. Anne converted the old Napa Auto Parts store into a grand vision that would later pave the way for, well another one of her visions, the Paso Robles Art Festival. Then after Ann’s super-brilliant-daughter, Sasha Irving, graduated from Georgetown; she came along side mom and added a fresh component to the equation. In Anne’s wake two new art galleries opened: Pierce Modern and Vale Fine Art on 12th Street. During this period, many wineries and restaurants were hosting exhibitions. In Fact, Vino Robles Winery actually opened a fine art gallery on their premises. But the visual art grand daddy of all in my opinion was Sculpterra Vineyard. It was John Jagger’s legacy project, and was it ever. It is a mind- numbing display of talent. The Sculpture Garden at Sculpterra is a must see. The Paso Robles art boom is not just a bunch of galleries popping like Carmel and Palm Springs; it has a much broader creative base a strong diverse foundation. Here is the math that makes Paso’s current renaissance a distinct and formidable movement: Artist having working studios, art on display at wineries, youth art education programs in place and now new galleries opening. In fact, there are two new galleries opening on 13th Street: the Heritage Collection and my own Dale Evers Fine Art Gallery. In fact, there are two new galleries opening this summer on 13th Street: the Heritage Collection and Dale Evers Fine Art Gallery. The new Dale Evers Fine Art Gallery at 840 13th St. is owned and operated by Tim and Nitzi Joannes. These are exciting times in Paso Robles for those of us who value the arts. It has been a long time coming, but it is safe to say, the train has left the station.